candles made with a premium, soft, highly refined, and of the highest grade wax combined with the finest fragrance oils to optimize burn and fragrance diffusion. Each pillow hand-stuffed with All-European white goose down and covered with world-class downproof fabrics. 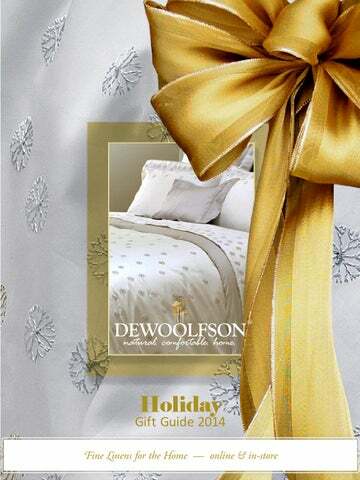 DEWOOLFSON pillows are sure to inspire sweet dreams. DEWOOLFSON comforters, pillows, and featherbeds are individually filled and sewn from the finest materials and shipped from our North Carolina factory. Filled with your choice of hand-select European white goose down and covered with some of the world's finest European downproof fabrics. Embroidered linen guest towels by ANALI and SFERRA are created with joy and personality in mind. Choose from some of the most luxurious throws found anywhere . . . from Scotland, France, Italy, Peru or Switzerland, in wool, cotton or cashmere. From $64 to $1700. We have something warm for everyone on your list! The world's finest linens! Giza cotton is the softest, smoothest, and most luxurious ever found - bar none! SFERRA Giza 45速 cotton is from the longest staple cotton grown in the fertile valley of the river Nile and is woven by master craftsmen in Italy. Bath towels for accent or exceptional softness and absorption. See one of the most luxurious and extensive selections including ABYSS stocked in 60 colors. Our Gift Certificate – the perfect gift for that oh− so−dear, yet hard−to−buy−for person in your life. You decide the amount and we will email them the wonderful news inside a lovely card. Simple and sincere. © 2014 DEWOOLFSON DOWN INT’L., INC.